The right kitchen appliances can make your life easy, making you feel like a master chef in your kitchen. One of the most useful appliances that you need to have in your kitchen is a blender. There are several kinds of blenders in the market that it can be difficult to choose the right one for your blending needs. If you are looking for the perfect blender for yourself, it is best to look for one, which has pre-set functions to make your blending tasks much easier. The last thing you would want is a big blender taking up a huge space on your kitchen countertop. When buying the perfect blender, look for a model that is compact, sleek and easy to store. Just like any other kitchen appliance, you need some time to learn how to use your new blender. However, by choosing a blender, which has easy-to-understand functions and display, you will be able to use it more easily. A blender should not only be functional, but also economical and energy saving. Look for the perfect blender, which has energy saving as well as has features to prevent it from overheating. The steel blades of your blender should be made of the best quality to make sure that the food items get evenly blended to perfection. Look for a blender with good quality steel blades, which are study and durable. Some of the best blenders come with a unique heating function. This function allows you to blend the ingredients to make hot beverages, such as soup, herbal tea and other delicious beverages without using a microwave! Make sure that the blender you opt to buy comes with a pulse function. This function lets the blender to run at its peak speed in short bursts for quick blending and mixing. Price is also an important factor when considering the perfect blender to buy. Compare the different blenders in the market along with their prices and features to choose the best one for your home. Just like the heating feature, the best blenders also come with a cooling feature, which allows you to make cold beverages such as iced tea, cold coffee, smoothies, and much more. 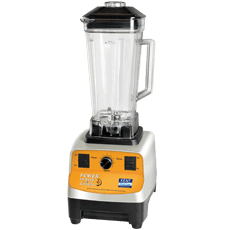 When looking for the best blender, choose one that offers lengthy warranty. This will ensure that the company will look after any repair, maintenance and servicing that is required after purchasing your blender. Buying the perfect blender for your kitchen does not need to be an overwhelming ordeal. With these 10 simple tips, you will be able to choose the perfect blender for your home!